Today is the start of a brand new cooking group- French Fridays with Dorie. The wonderfully talented Dorie Greenspan has come out with a new cookbook, Around My French Table and Laurie, the founder of Tuesdays with Dorie, along with the help of a few other talented people, has put together a group that will be cooking our way through this gorgeous cookbook. have taught me so much about baking and given me the opportunity to bake things I never would have thought to make and I have TWD to thank for that. Dorie's recipes are always fantastic and delicious. At first I was unsure as to whether I wanted to join in, simply because I like cooking and choosing for myself what I am going to make for dinner. But, when I looked through this cookbook, I realized that joining this group and cooking through these recipes would push me to try new and fun things. I haven't ever really cooked french food, so I thought it would be an adventure. I absolutely love trying new recipes. Plus, there are lots of things that I love in this cookbook, like lentils, beets, fish, green veggies, eggs, and of course desserts, so I decided to go for it. 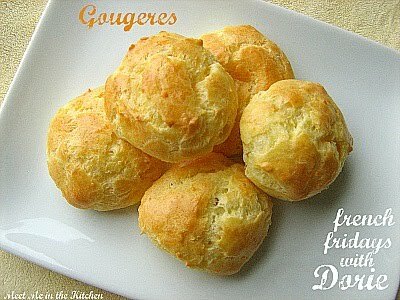 Dorie chose this month's recipes and started us off with Gougeres-cheese puffs, that are made with pate a choux dough, the same dough you use to make sweet cream puffs, eclairs, or profiteroles. Dorie says that these are made everywhere in France and calls them one of France's "national treasures". The dough comes together quickly and if you follow the recipe directions, these are a really easy thing to make. They puffed up beautifully. My only regret is that I didn't buy the more expensive Gruyere cheese to use in these Gougeres. I used sharp cheddar because it was much more affordable, but the cheese flavor wasn't as pronounced as it should have been in these lovely cheese puffs. The recipe makes a lot of gougeres, and Dorie said they bake up well if you freeze the little mounds of dough and bake them straight from the freezer. I only baked up 5 of these, so that we could taste them and froze the rest for later- they would be a great appetizer at a party, filled with some sort of savory deliciousness. If you want to see who else joined in on these tasty little cheese puffs, check out French Fridays with Dorie! Dorie has posted this recipe HERE or you can find a pdf copy of October's recipe HERE! Your gougeres are beautiful - although I had the same problem with my sharp cheddar not being sharp enough. LOL, I agree with your post on all points... and I only baked 5 before stashing the rest in the freezer. (the recipe made a LOT!) Anyway, yours look all perfect and puffy. Nice work! Look how beautiful yours puffed up! It's like magic, isn't it?! This recipe is one I know I'll repeat over and over. I used cheddar, too. Next time I would like to use gryuere as well. They look wonderful! so exciting to see so many TWDers in the group. IT is going to be such fun. Your gougeres came out beautifully. Lovely gougeres. They're so puffy. What a beautiful photo! The gougeres look perfect. I used a blend of sharp cheddars and the flavor was very cheesy...have to try them with gruyere, though! Funny, I thought gruyere was rather bland - and wanted to try sharp! They look absolutely wonderful - nice and puffy, like they should! I'm excited to try a few new cooking dishes as well- I feel like I've only been baking-no cooking- for the past year or so! These look so delicious Mary. I have been kicking myself in the head while reading all the posts since Friday for not joining the group. Sounds like so much fun. Can't wait to see what else you make.